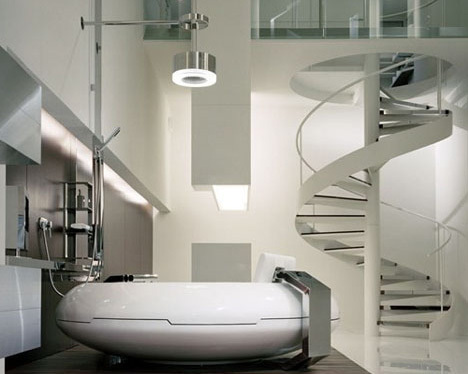 Well-suited for truly open loft living, this bathing system is not for the shy – it combines the openness of a hot tub with the jets of a Jacuzzi and the functionality of a shower, all in a sleek UFO-shaped package. The downside is that there are in fact no sides – one has to wonder a little whether the shower portion will work well without a curtain, even with the large footprint of the round tub below. 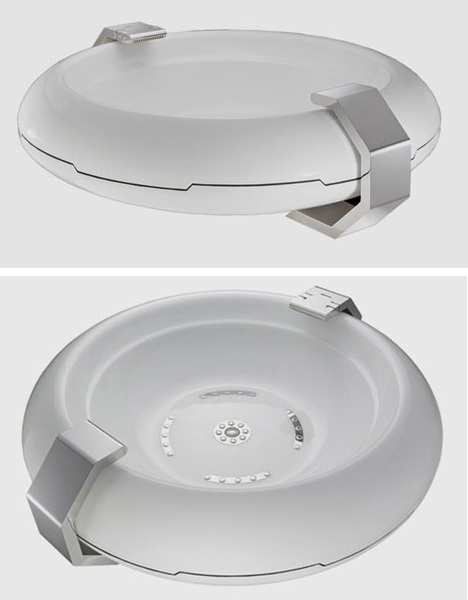 Spiritual Mode makes this odd marvel with dual steel side faucets and a series of semi-circular bubblers around the base, distributed evenly for easy multiple-person use. The whole thing looks prepped to take flight, once the docking clamps (faucets) are folded back from the sides.